Aging: An Apprenticeship – An intimate and lyrical account of aging through the decades. These thoughtfully selected essays offer an intimate and lyrical account of aging through the decades. Authors Judy Blume, Andrew McCarthy, Gloria Steinem and others draw from their own experiences, describing life’s losses and gains to form a complex and unflinching portrait of the years from nearing fifty to ninety and beyond. APRIL 2018: Aging: An Apprenticeship was awarded a Silver Medal at this year’s IBPA Benjamin Franklin Awards, in the Best First Book (Nonfiction) category The awards, given by the Independent Book Publisher’s Association, are given annually to books of distinction from small publishers; more information can be found on the IBPA website. SEPTEMBER 2017: The Washington Post published a lively interview with Nan Narboe about the creation of Aging: An Apprenticeship. You can read the article here. Order the book today! 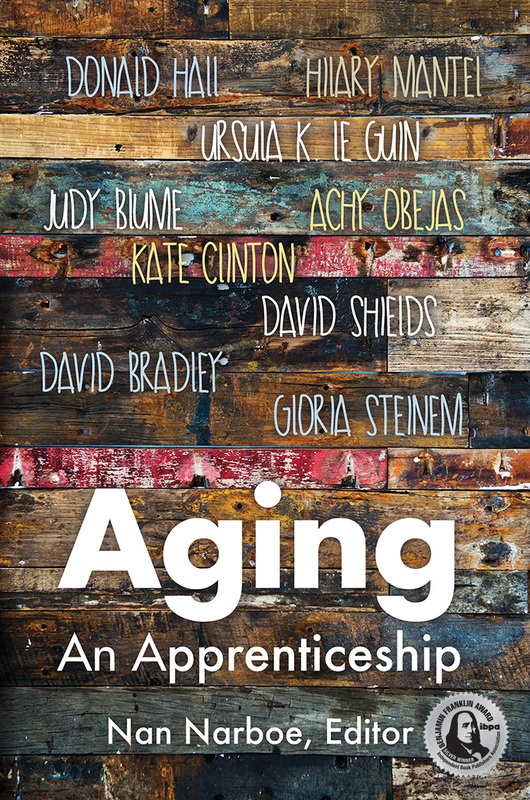 Aging: An Apprenticeship is now on sale from your local bookstore, and from many online outlets. I found something to love, something to laugh about or cry about, something to wish I’d written myself, on every page of this book. Fun (and nostalgic) to look back at my fifties when 72 seemed so very old. Moving (and inspiring) to look ahead to my 80s and beyond. [This is] a necessary book, one I’ll return to often. We all have our own way of meeting the reality of old age: sometimes with humor, sometimes with regret, and sometimes with nothing to go on but stubbornness ... so it’s a delight and a comfort to read these wonderful writers giving voice to our deepest feelings. Nan Narboe was just the editor to pull it off, she of grace and wit. Who couldn’t use a tour guide to the territory ahead? Better yet, more than 50 fierce and funny guides, who usher us across the shallows and over the waterfalls in this wonderful anthology.